Can you shake, rattle and roll and still get sharp photos? There are a lot of slimline compacts on the market and the Z100fd has to fight hard for market share. There are better examples from the likes of Sony and Olympus so for us the Z100fd just doesn't cut it. The looks are great but usability and image quality let the side down. Handbag and party cameras are a dime a dozen these days. They come in all manner of fashionable colours and they're designed to produce vibrant snaps that you can post on Facebook even if your hands are shaking from one Bacardi Breezer too many. So what marks the Fujifilm FinePIx Z100fd out from all those other pretty-in-pink pocket cameras? Well, the Z100fd is better built than most. Its brushed aluminium case is available in a range of fetching two-tone colours, including pink, silver, black & white and brown. The lens is covered by a wafer of brushed metal that pulls down, diagonally illuminating a Z logo as it switches on the camera. Behind the cover is a non-extending 5x optical zoom. It's swish all right. In fact, Fujifilm says that the Z100fd is sure to be a hit with anyone who cares about their image as much as they care about the images they shoot. 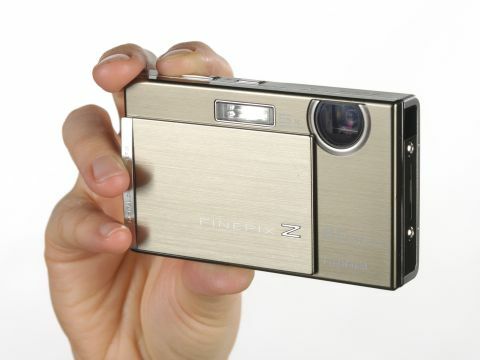 The Z100fd is built around a Fujifilm 8MP 1/2.5-inch CCD. Fujifilm often uses larger sensors than other manufacturers and that accounts for the great Fujifilm image quality. Sadly that's not the case here. The tiny sensor is necessary because the Z100fd is a wafer thin 19.8mm. The 5x optical zoom is unusual in a camera so slender and it does offer a useful 36-180mm angle of view in 35mm terms. That means you can get in nice and close for those Facebook shots at the disco. The built-in dual image-stabiliser offers both CCD shift and boosted ISO levels to ensure sharper shots. And to make those shots stand out on the larger-that-average 2.7-inch LCD, Fuji whacks up the saturation big time. If you're looking for subtlety then forget it. The Z100fd has all the subtlety of a sledgehammer. Face recognition is also included so that should keep everyone in the hen party happy. Instead of having lots of buttons all over the place, Fujifilm has opted for a rather nice thumbwheel arrangement for selecting different modes. That's the good news... and now the bad news. The menu system is so arcane and fiddly to the extent that nothing about it feels either intuitive or logical, even when you're sober. So how on earth anyone could get to grips with the settings after a heavy session on the dance floor and a few alcopops too many is hard to imagine. Better to leave everything on auto and hope for the best. Unfortunately the best isn't going to turn up in this case. The image quality of the shots from the Z100fd are decidedly average. The colours are often far too saturated, the sharpness is disappointing and the results simply fail to impress due to an excess of noise. However, if you want a camera that you can pose with while clubbing and for taking a few snaps of your best friends with the flash on all the time, you may not be disappointed and you'll certainly love the looks. So, is there anything to really like about the FinePix Z100fd? Well, the Auction mode is quite fun to use. It enables you to take up to four separate shots and have them compiled into a single image file. If you use auction sites like eBay, it means you can upload a shot that shows four views of what you're selling, and only pay for one photo. It's handy but nothing you couldn't do yourself. The Blogging mode might also appeal to a few people, as will Fujifilm's inclusion of IR Simple technology for beaming pictures to other people with IrSimple kit (we don't know anyone with IrSimple kit either, but it may become popular in time).